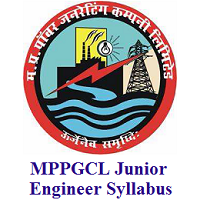 Looking for the MPPGCL Junior Engineer Syllabus 2019? then you have ended up in the correct place. All the candidates, who are searching for the preparation materials can check our site right now. Down in this page, we are trying to incorporate the complete MPPGCL Syllabus 2019. All the people who are preparing for the Accounts Officer, Junior Engineer Exam can check this post. And the officials of the Madhya Pradesh Power Generating Company Limited (MPPGCL) decided to conduct the मध्य प्रदेश पावर जनरेटिंग कंपनी लिमिटेड Test in March 2019. Now, we have taken enough care to include the complete MPPGCL Accounts Officer Syllabus 2019 in this post. Also, in a separate section, we even gave the complete MPPGCL Exam Pattern along with the Madhya Pradesh PGCL Selection Process 2019. All you have to do is check the information and include them in your preparation strategy. To the bottom of this page, you can easily find the direct link to download the mppgcl.gov.in Syllabus 2019 PDF. marks obtained by them. As per requirement candidates will be called for document verification at Jabalpur Head Quarter. Check the following table and this will give you a glimpse of the MPPGCL Exam Pattern 2019. Now, along with the MPPGCL Accounts Officer Syllabus and also with the help of this Exam Pattern, you can all start your preparation for the Written Test. Preparing with the mppgcl.gov.in Exam Pattern will have its many advantages. Now, you will get an idea where the more weightage of marks will come from and all. And the test is of Objective Type (MCQ) Online. So, check the below table and move further. So, we all know that recently, the Madhya Pradesh Power Generating Company Limited (MPPGCL) officials have announced a Recruitment Notification for the Accountant Officer, Junior Engineer vacancies. And through that, the officials of the MPPGCL has mentioned that they are hiring people for the 84 Vacancies. And for this, many of the Job seeking candidates have applied. Now, all such people have started their preparation for the mppgcl.gov.in Examination. But many of the candidates are yet not able to find the correct source to get the MPPGCL AO, JE Syllabus 2019 for their preparation. Now, keeping all such scenarios in mind, we have gathered the updated and the latest MPPGCL Accounts Officer Syllabus 2019 for the sake of the candidates. Now, remember the important fact that, if you prepare according to the MPPGCL Syllabus, you can surely get good marks. Got all the information regarding the MPPGCL Accounts Officer Syllabus 2019? Then, for more such exciting news, you need to stick on to us on our FreshersNow web portal.